Why hello, beautiful birthday! Today’s party comes to us from the same talented lady who brought us the charming Barber Shop Birthday last September. While that party was definitely a manly-man theme, today’s party is all girl! 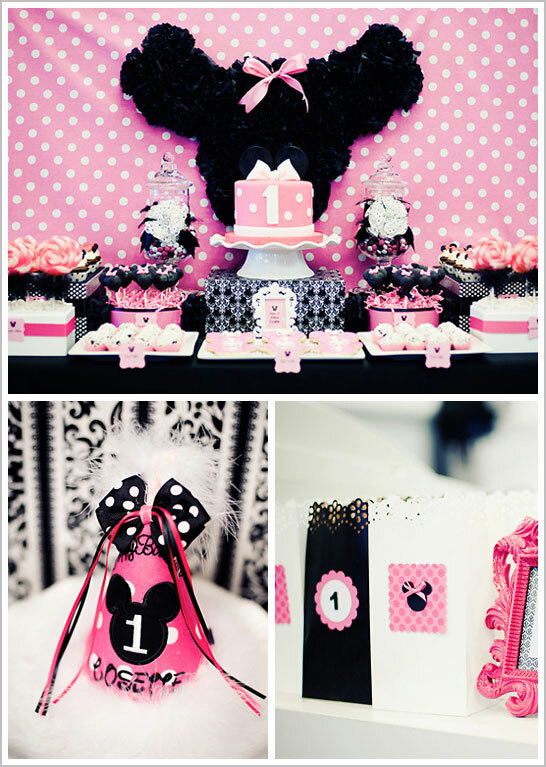 With a hot pink, black and white color scheme, polka dots, damask and feathers… this party is so sassy. And talk about oodles of incredible desserts. 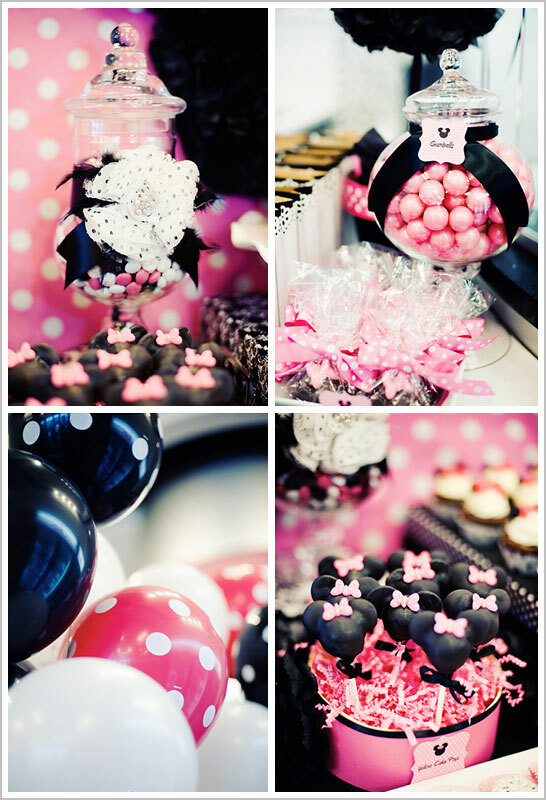 This party would have Minnie herself saying “Aren’t you sweet!” Let’s take a look at this precious Minnie Mouse 1st Birthday Party, styled by Dawn Menon of Bee*s Knees Parties and featuring an abundance of delightful cakes and sweet treats! 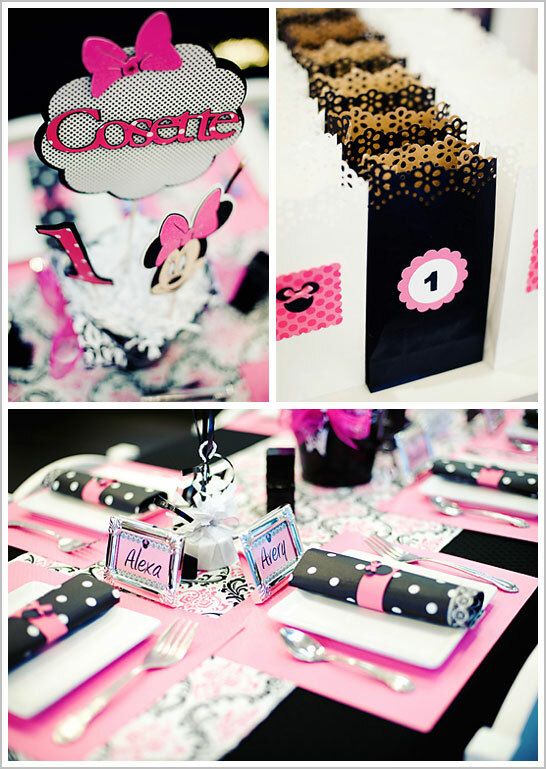 “This party was for one of my clients whose daughter loves Minnie Mouse. My client owns a D’Lites frozen yogurt store on Long Island, and wanted to have the party there. We chose to follow the color palate of the store, which happens to be black, white and hot pink. Look at all of those incredible sweets! Minnie Mouse cupcakes, cookies and an adorable smash cake for the first birthday girl! And check out the main cake… it’s actually an ice cream cake made by the frozen yogurt store and then decorated with fondant pieces from The Hudson Cakery. Doesn’t it look delicious? Not to mention oh-so-cute! So many delightful details in pink and black, all adorned with Minnie’s little black ears and signature bow! Minnie, Minnie everywhere! From the whimsical backdrop down to the every last cake pop, this party is like a trip to Disneyland! Perfectly sweet and full of fun! 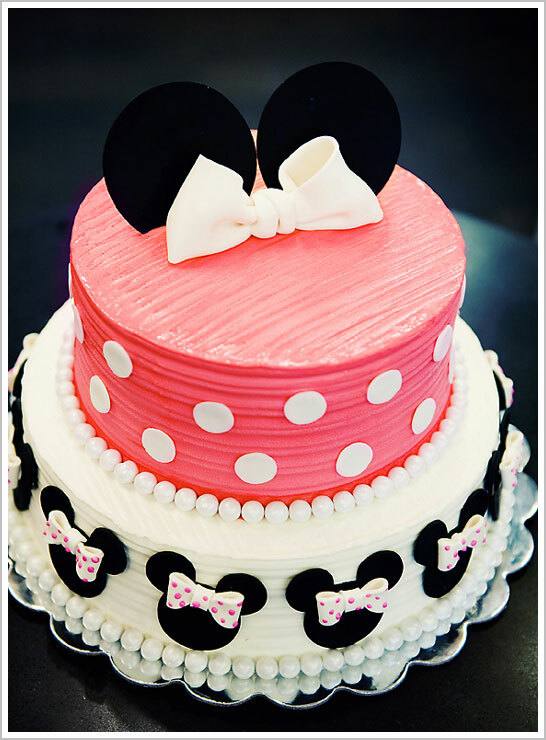 A special thanks to Dawn Menon of Bee*s Knees Parties and Keiko Niwa of 2 Girl Phototique for sharing this darling Minnie Mouse 1st Birthday Party with us! It is just darling! All I have to say is, WOOOOW!!! This is seriously one of the prettiest parties I ever seen!!! I LOVE the pink, black & white!!! Absolutely gorgeous!! So very fun! 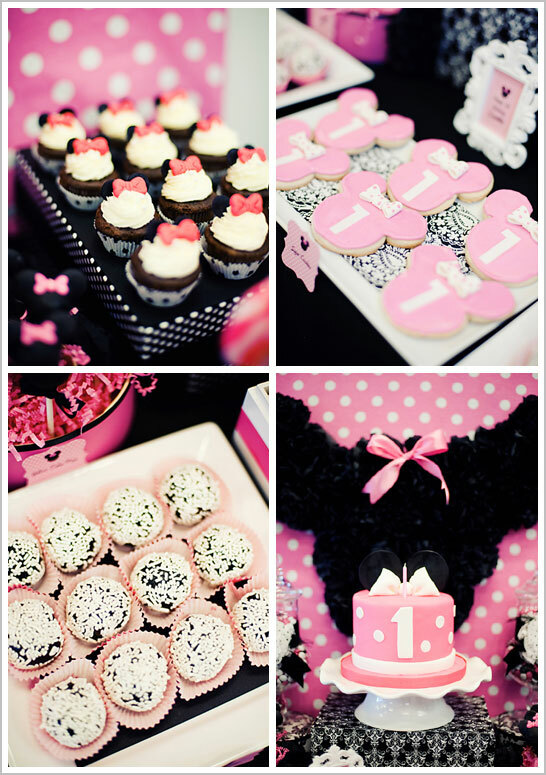 I love all of the black and white polka dots combined with the hot pink! Love! What a cute birthday dessert table! The cake is great, but the whole table is impressive! Such a fun party! The cake is awesome, and I love all of the bows on everything. Hi Carrie. The ice cream cake looks yummy. If possible, can you share the recipe with me? I was wondering what the big Minnie Mouse head behind everything is made of? I really want this for my daughters 1st birthday which is next month, how much will it cost for the entire table decor plus the wall decor? This is ABSOLUTELY PRECIOUS! I want to do this for my little girls 1st birthday! How much will it cost me to get it OR do it all? This is BEAUTIFUL. How much would it cost to have this same party planned for my daughter’s first birthday in October?